Is there another Kardashian-Jenner baby boom on the horizon? Given today's news that Kim Kardashian and Kanye West are expecting baby No. 4 via surrogate in the coming months, it's certainly possible! 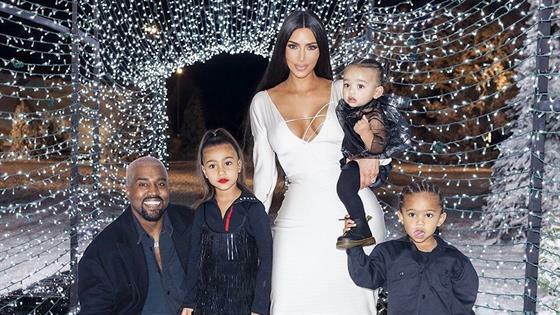 Kim, Khloe Kardashian and Kylie Jennereach welcomed children of their own in 2018, and a source tells E! News that some of her sisters are already thinking about getting pregnant again. "Kim having another baby this year is heavily influencing her other sisters and their baby plans," the source notes. "They all loved being pregnant at the same time and everyone wants all of the kids to be close in age. Everyone jokes about having another round of 'triplets' all the time." Born within a few months of each other and practically inseparable, cousins Chicago West, Stormi Webster and True Thompson have become known as the "triplets" within the Kar-Jenner clan. "I definitely feel like we are more connected now, especially that Khloe's back and we're hanging out with all the babies," Kim told E! News of the experience. "All the kids want to hang out. It's just a whole different experience now. It's so much fun." Meanwhile, 21-year-old Kylie has previously expressed her and boyfriend Travis Scott's desire to expand their family. "Am I going to have another baby? I want another baby but, 'When?' is the question and I'm definitely not ready right this second," she told her social media followers in October. "And I don't know when I will be, but when I do, I would love to share more of that with you guys." The same is true for Khloe, 34, who a source previously said "definitely wants True to have a sibling and would love to have a big family." Explained the insider at the time, "Things are up and down with Tristan Thompson, but she would like more kids with him. That's what she feels will make the most sense for True and their little family. As for Kim and Kanye's latest baby journey, our source says they "hope to keep things well under the radar this time around." "This is going to be the last child for them as they do not have any embryo's left," adds the insider, "and think four children will complete their family. They both agreed that they wanted all of the kids to be close in age and grow up together." We're told the pair is expecting a baby boy in May.